Tropical flowering trees are spectacular ornamentals in the landscape. But if you don't happen to live in a year-round warm climate, you can enjoy their breathtaking beauty close-up by growing them indoors. This exquisite beauty from Brazil gets its name from the mapleleaf-like foliage that covers its upright stems. 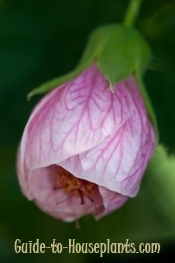 It's the colorful, papery bell-shaped flowers, however, that makes flowering maple a stand-out. Plenty of sunshine will produce the most flowers. Put your tree directly in front of a window or scoot it outdoors to a sundrenched patio for the summer. An island favorite, the plumeria tree is magnificent. Clusters of fragrant flowers bloom like bouquets at the branches' tips. Those gorgeous blooms are used to make flower leis in Hawaii. Give your tree plenty of warmth, sunlight and humidity and you'll watch it bloom for months on end. You'll want to give this glorious flowering tree some room to grow, too. 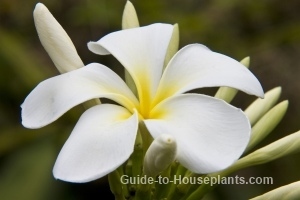 Even planted in a pot, you can expect plumeria tree to reach several feet tall. It's a good candidate for a greenhouse or sunroom. Some small citrus trees are adaptable to indoor growing. 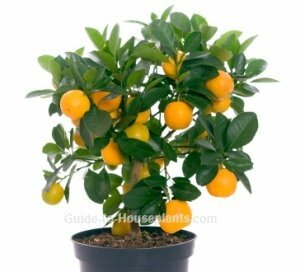 If you have room in front of a sunny window, consider a calamondin orange tree (shown here). This sun-loving dwarf fruit tree will bear flowers and fruit for months on end. If you love to cook with fresh ingredients like I do, you may also want to add a 'Meyer' lemon tree to your plant collection. Mature trees will bear fragrant, white flowers that are followed by fruit that turns from deep green to bright yellow as it ripens. 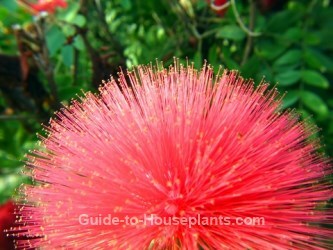 Colorful, bright, fuzzy blooms are the hallmark of the South American Powder Puff Tree. It's also easy to grow -- and, well -- just plain fun to have around. Those puffy flowers can grow up to 3 inches (8 cm) wide. You'll enjoy a succession of blooms on this evergreen shrub that will last for several months. If you can meet it needs for warm sunlight and moist air, you'll keep this beauty blooming every year.